The painting “Village Love”, one of the best works of Bastien-Lepage, was acquired in Paris by Sergei Mikhailovich Tretyakov. brother of the founder of the Tretyakov Gallery, and bequeathed to them in this meeting. It hung among the paintings of Russian masters of the second half of the XIX century for more than thirty years. Apparently, the famous collector attracted the work of the French artist the same desire to convey the truth of life, which was typical of the work of Russian painters of the time. Bright spring evening. The old fence dividing the two farmsteads is a guy and a girl. Shy, embarrassed by the meeting, they timidly look for words that could tell each other. Their excitement is so naturally conveyed by the artist, that everyone involuntarily empathizes with them. The state of embarrassment binds young people: the guy looks at his fingers, the girl is fumbling with the flower presented to them. In the creative heritage of Bastien-Lepage left a lot of sketches from life. There is a drawing for this scene, which he observed in his native village Damviller. The artist wrote what he saw, and not composed. And for him, every detail was precious, which would enhance the life-likelihood of this scene: a collapsing fence, curling ivy, burning red-orange nasturtiums, women’s figurines inclined to the ground. A girl with thin pigtails and a guy in work clothes of a craftsman are depicted not only with authenticity and psychological depth, but also with a great poetic feeling. Both of them have strong roots to the earth. The customs of the native Lorraine, which the artist loved so much, bring them closer together. At the heart of Bastien-Lepage’s creative method was work from nature. He sought to convey its characteristic, unique features, revealing in a particular phenomenon common, typical features. When the painter shied away from the direct reproduction of nature, changed himself, invented and composed the composition, then failed. And he had to experience a lot of creative torment, before he finally chose the path of a realist artist, a chronicler of his land. 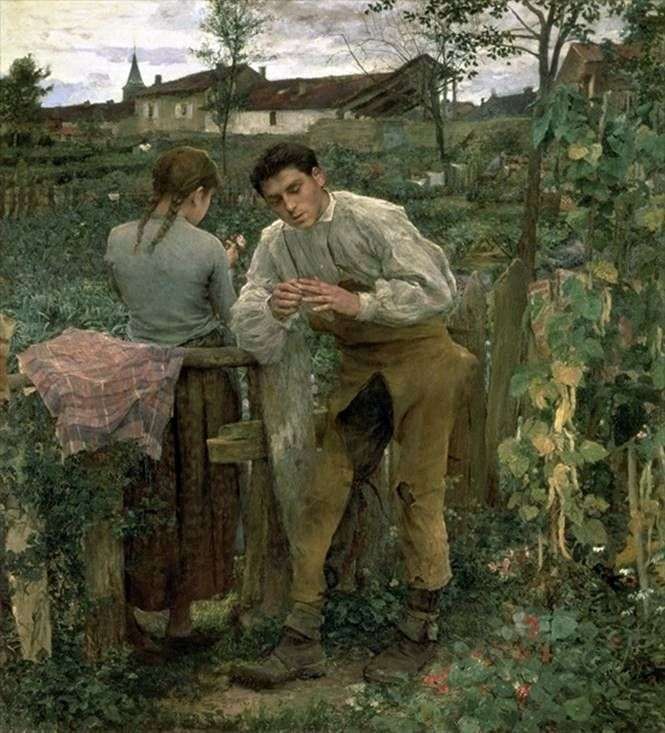 Description and meaning of the painting Rural love by Jules Bastien-Lepage.